The team analysed numerous publications that have contributed in recent years to determining CO2 emissions from freshwaters and their contribution to the carbon cycle, and the reasons for their increased desiccation. Strictly speaking, freshwaters, and lakes in particular, primarily act as C sinks – long-term carbon accumulation occurs in their sediments. If water levels fall, however, an increasing share of the lake bottom is exposed to atmospheric oxygen. The drier sediments become, the more aerobic respiration increases – dead organic matter in the lake bottom is used by bacteria, which leads in turn to the production of CO2. "Our analysis shows that lakes should not be considered just as C sinks; on the contrary, they emit gaseous carbon when they fall dry," emphasised Gabriel Singer. These effects are likely to increase in importance under a changing climate: on a global scale, for example, around 90,000 square kilometres of water surface have vanished completely in the last 30 years. Another article by Gabriel Singer's team published recently explores the effects of alternating dry and wet phases in river ecosystems on fluxes of matter. During her time as a visiting young scientist at IGB, Marisa Arce investigated the existence of nitrogen in sediments, ammonia oxidation, and emissions of nitrous oxide, another important greenhouse gas. In fact, nitrous oxide decreases during dry periods, but increases again as soon as rainfall occurs. 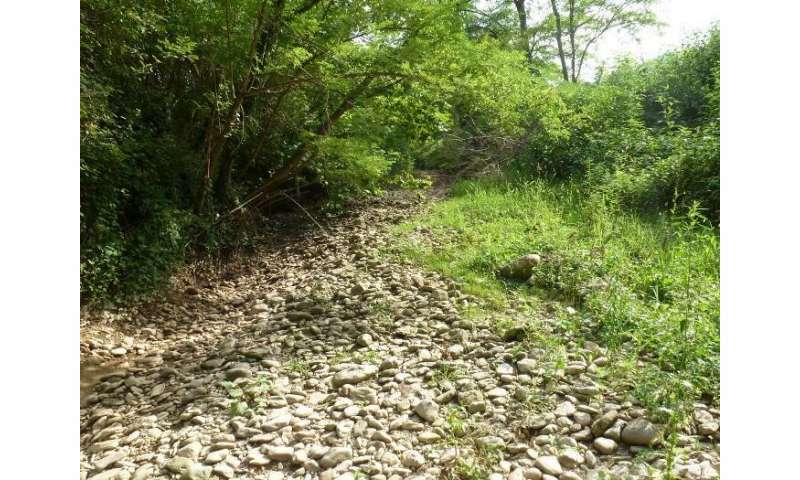 The findings help scientists understand more clearly the behaviour of nitrogen fluxes in rivers and streams exposed to alternating dry and wet phases. Due to climate change, such a scenario will affect a larger number of river ecosystems in the future – and may change the role they play in global matter cycles.